This book is the best that I have read all this year, with a truly gripping plot and a really atmospheric characterisation. Newly qualified, Glasgow firearms officer Constable Jamie Worth is sent to a domestic disturbance. He is told by the senior police officer, Inspector Coltrane, that a dangerous armed teenager is in this flat and the sound of gunfire is what aroused the notice of the neighbours. Jamie and another armed police officer are being directed to take up their positions by radio transmitters, as their uniform helmets make other communications difficult. Coltrane asks Jamie to take up position at the front of the property and the other officer at the rear. The dangerous armed teenager flees the building and Jamie is urged to open fire and he shoots, fatally wounding her. He is told to go home and to his absolute amazement is charged with her murder. The tapes of the radio communications have disappeared and Coltrane and all of the other police in attendance swear that the dangerous teenager wasn't armed and there was never a gun and armed firearms officers were only called as backup. A stitch-up! Eventually, Jamie is remanded and goes to trial and the effects of all this on his wife (herself a former member of the police) and his two young children is vividly described. Jamie had a girlfriend Anna, whom he had given up for the love of his wife and she is a Glasgow police inspector. She is in New York on a course when the shooting occurs and only hears about it briefly in a BBC World news bulletin. Jamie has to be remanded to a very tough Glasgow prison called Barlinnie and has to go through all the indignity of being strip searched and having to accept the issue of soiled prison clothes and the constant reminders that the other prisoners detest him because he is a 'pig'. Being a serving policeman is not a popular occupation in a Glasgow prison! Soon he is nearly raped in the showers and he then is put into isolation in the prison for his own safety. But every day there is another challenge, as he has the experience of seeing other prisoners and prison warders who despise him spit into his food and drinks and do all kinds of debauched practises because of his status. Anna, the ex-girlfriend starts investigating into the shooting, unofficially, when she returns from the US but has great difficulty because of the antipathy and anger directed against her by fellow police who don't want to disturb what already has occurred. The story speeds to a truly riveting conclusion. AFTER THE FIRE, which is only the second by this astonishingly good new author, is very unusual in that it has a very distinctive and thrilling beginning, a good middle and sensational end. Authors generally do not do all three so well. The only minor criticism I have of this writer is that she uses a lot of Glasgow slang which, without a glossary, or other explanation to my London eyes was very puzzling. If she wants to emulate the success of other Scottish writers such as Ian Rankin, she should make her stories able to be enjoyed by the widest audience of readers of English wherever they live (Scotland, England, or the USA) and perhaps consider avoiding the use of Glasgow vernacular, which, whilst used to authenticate the speech patterns of local citizens, may be a turn off to non local readers. It really is a very extraordinary book, because of the marvellous characterisation of Jamie, his wife and all of the other characters, the descriptions and exceptionally vivid picture of life in prison. The quality of the writing was exceptional. I will definitely put this novel on my top five best reads list of 2010 unless, in the unlikely event, I read five better titles this year. I will certainly look out for her future books and hope she writes many more of this quality. 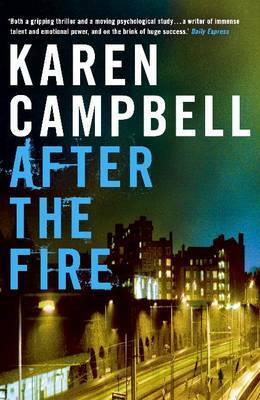 Read another review of AFTER THE FIRE.